Gulmit: Chief Guest Gul Baig, MLA Mutabiat Shah, Sharif Khan President RC Hunza and Nazir Ahmed Bulbul showing the book to the audience during the launching ceremony. 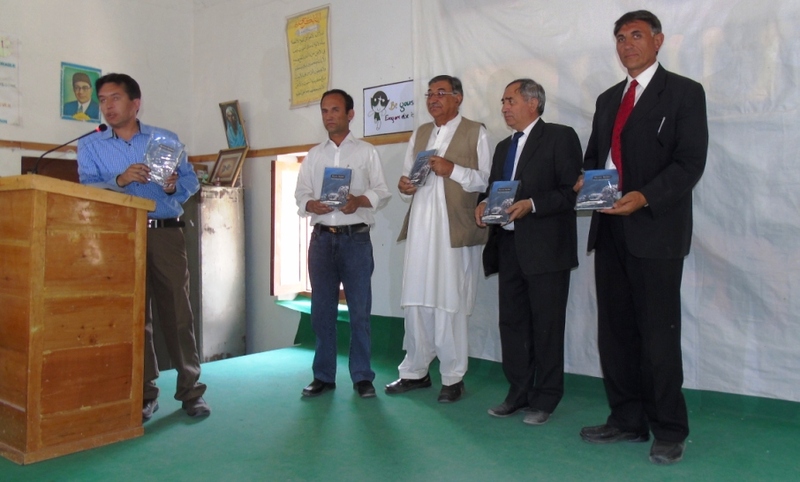 Gulmit, July 31: The first ever book of Wakhi language poetry titled Biyoz-e-Bulbul was launched today in Gulmit, the Tehsil Headquarters of Gojal Valley. Biyoz-e-Bulbul is a compilation of renowned Wakhi poet, Nazir Ahmad Bulbul. Speaking at the occasion, the Chief Guest Gul Baig congratulated Nazir Ahmed Bulbul for his contributions towards Wakhi literature and poetry. He termed the launching of the book to be a milestone in the history of Wakhi language and literature. MLA Mutabiat Shah said that launching of the book is a historical event. 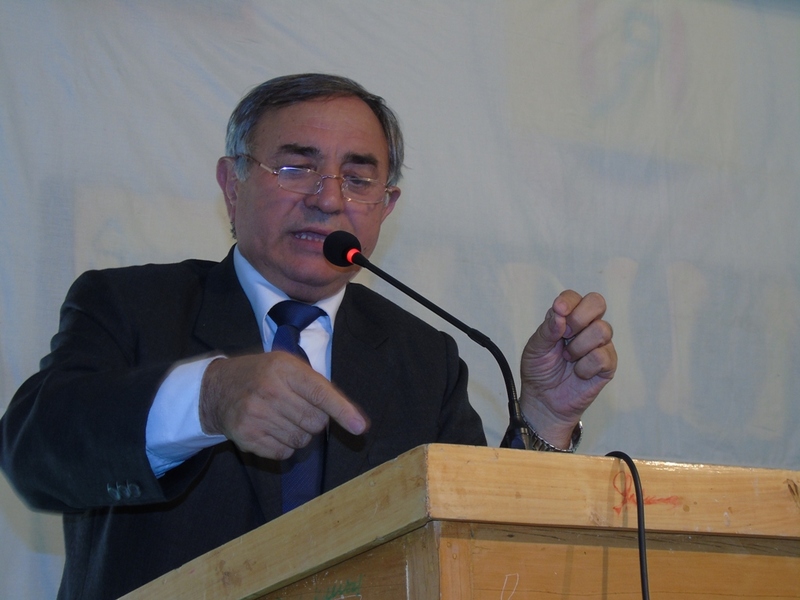 He also spoke about Nazir Ahmed Bulbul’s personality and his contributions to Wakhi poetry. Other speakers included Al-Waiz Muhammad Aslam, Assistant Professor Sultan Ahmad, Muhammad Rehbar, Vice President WTCA, and renowned Wakhi poet Saifuddin Saif. d and rich tributes were paid to their contributions. 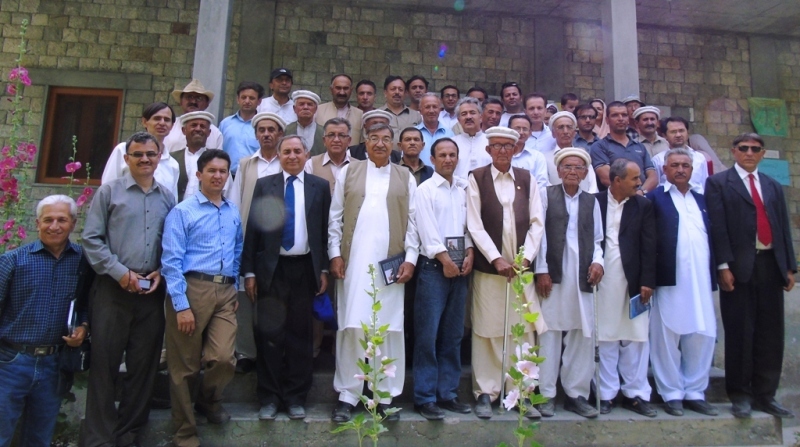 The launching event was attended by Gul Baig, Accountant General Pakistan Revenue Gilgit-Baltistan, Sharif Khan, President Regional Council for Hunza, MLA Mutabiat Shah, Majeed Khan Director Education GB, Alwaiz Muhammad Aslam, Assistant Professor Sultan Ahmad, renowned Wakhi poet Saifuddin Saif, among other local notables and activists. The book has been published by Pamir Media Group, an indigenous institution promoting research and scholarship in the field of media, culture and arts.